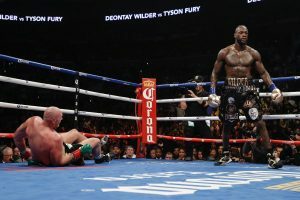 A thundering right and a follow up left from the most potent hands in boxing dropped Tyson Fury in the 12th round of the WBC heavyweight title fight in December. The die seemed cast. But the hulking Englishman rose up from the canvas, before the fat lady could belt out the first note and just after Referee Jack Reiss had counted “nine.” In a way, his astonishing recovery mirrored the revival of heavyweight boxing in recent times. The sport overall is healthier than people give it credit. The middleweights have Canelo and Golovkin. Below them in a range of weight divisions are refulgent talents such as Terrence Crawford, Errol Spence Jr, Mikey Garcia and the incredible Vasily Lomachenko. Old hands like Pacquiao are still around. Yet, it is the heavyweights, or rather DeontayWilder’s classic with Fury that was the apex of 2018. Sometimes, we make too much of too little. Yet, it’s understandable in this case. For so long, the heavyweight division was the most important in boxing, though fans of Sugar Ray Robinson and Marvin Hagler may take umbrage. To be heavyweight champion was to be the most famous sportsman on the planet. So, what happened in the 21st century that made the division so forgettable? Was it lack of skill? Was it lack of personality? Was it both? The Klitschko brothers were doubtless amazing, albeit robotic fighters, even if the competition around them left a lot to be desired. Alas, they did not have the fighting style or the controversy to keep the division at par with what the likes of Pacquiao and Mayweather were doing do in the lighter weights. Yet, their most damning issue was the comparison against what came before in the division. The 1970s had Ali, Frazier and Foreman as champions and a rung below them were accomplished fighters such as Norton, Quarry and Bonevena who were capable of holding their own against anyone. Between them Ali, Frazier and Foreman fought each other a combined six times, some of them wars that are indelible marks on the game’s history. Norton himself fought Ali to three close fights, winning one in the process. The first 15 years of the new millennium had very few memorable heavyweight fights. Lewis-Tyson was 10 years too late and Lewis–Vitali Klitschko was a case of what could have been. Then suddenly out of the blue like an Ali short right, we were blessed with the surprisingly good Joshua–Wladimir Klitschko in 2017 that provided gasoline to the flickering embers of heavyweight boxing. The current generation has it in them to make the next few years a special time in what is historically the blue-riband division of the sweet science. For one, as Fury and Wilder showed, they are willing to fight each other. Is Joshua willing to dance with them like he did with Wladimir? Chances are, he is, but boxing promoters have always sought to protect their golden geese from the time of Jack Johnson and Jack Dempsey. Joshua remains the most marketable – a good-looking and seemingly well-mannered champion, who has three of the four belts and is the youngest of the triumvirate. The matchmaking though sometimes embarrassing is understandable in this day and age. How wonderful would it be though, if his handlers just bit the bullet and put him in against any of the other two? What’s amazing to note is that the two Englishmen and the American have never lost in the combined 91 times they’ve stepped into the ring. Also, that the division’s health is peachy is reflected by the competition immediately below them. The likes of Joseph Parker, Dillian Whyte and Luis Ortiz are hardly cans and have the skills and the styles to give anyone fits. The answer may still be “nothing” as long as today’s promoters stay out of the way and let these warriors at each other. We shall wait and hope.